Senior Airman Michael Krawczyk and Staff Sgt. Jordan Hebner, both 86th Dental Squadron dental assistants, leap into a pool during the annual Mudless Mudder July 21 on Ramstein. If teams could not clear an obstacle, they were required to perform ten burpees to continue the race. The Mudless Mudder is a 5-kilometer race planned and hosted by volunteers from the 86 Airlift Wing consisting of obstacles that test strength, agility and resilience. For team Tooth Slothy, it’s a race for last place among 80 or more teams. While being the slowest may seem easy, for Tooth Slothy it had its challenges. With a whopping time of 3 hours and 20 minutes, this is the fourth year Ruleau’s team won the last place trophy for the Mudder, and it was all for the sake of fun. Ruleau said it also helps with her position as an NCO. 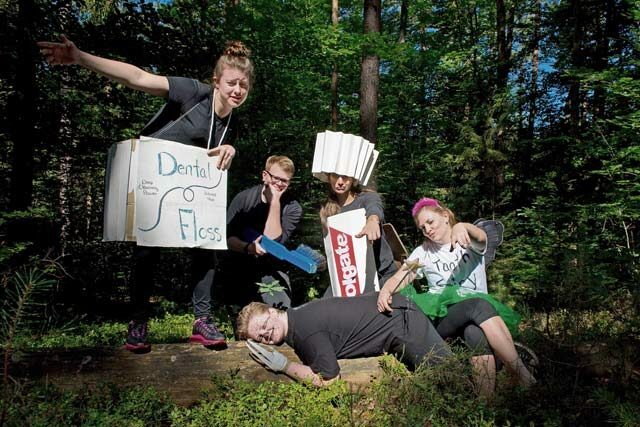 Tooth Slothy, a team of 86th Dental Squadron Airmen, pose for a photo in the woods during the annual Mudless Mudder July 21 on Ramstein. The Mudder hosted more than 80 teams with members dressed up in costumes to show spirit. Tooth Slothy garnered their fourth trophy as the slowest team in the race. Senior Airman Jessica Slatt, 86 DS dental assistant and Tooth Slothy teammate, said the Mudder builds camaraderie between her peers. As dental assistants, working with patients gave them the patience they needed to score last place. For Ruleau, with patience comes resilience. Tooth Slothy plans on keeping their title as the slowest team. Tooth Slothy, a team of 86th Dental Squadron Airmen, assist each other through an obstacle during the annual resilience day Mudless Mudder July 21 on Ramstein. Each obstacle required the help of teammates to accomplish in an effort to improve cohesion between Airmen.